I’m a huge fan of the Nest thermostat. I installed one about a year ago and it’s been humming right along since then. The Nest is pretty smart. It can be even smarter. As powerful as it is, the Nest is hindered by its inability to collect temperature data from more than two locations: the outdoor temperature from the zip code in which it’s installed, and the indoor temperature from the hallway (or room) to which it’s tethered. 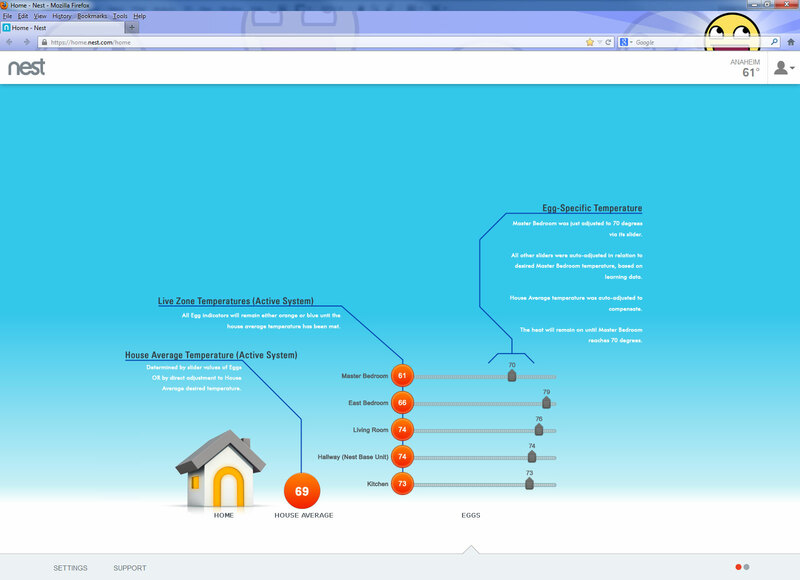 There should be some way to feed Nest temperature data from as many different locations in a home as possible. Without that data, all you’re really doing is effectively controlling the climate of the area immediately around the Nest itself. While Nest brings to the table a lot more than a standard programmable thermostat, this is one vestigial limitation that it hasn’t (yet!) managed to shake. I’m not the best at UI/UX design (to which 350,000 screaming DreamHost customers can attest) but I think these get the idea across. It’s a simple, plug-in thermometer. Minimal power drain. You put one in each room that you want your Nest to know about. Eggs monitor temperature and humidity, and they report them to your Nest base every 30 seconds or so using either Wifi or HomePlug. That’s an Egg’s only job. 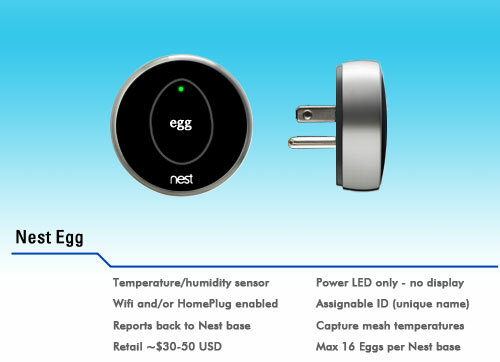 As far as your Nest base station is concerned, an Egg is just a room full of temperature. Without an Egg (or something like an Egg) right now there’s just no way for current Nest hardware to capture additional data about various zones in your home. “House Average”. That’s what it’s all about. Now, instead of knowing the temperature in the immediate area of your Nest, you’ll have access to a zoomed-out snapshot of your entire home’s average temperature at a glance. And, instead of commanding your Nest to modify the temperature of a limited sensory area, you can now direct it to look at your house as a whole and work to modify the climate in a much more meaningful way. For most people, that’d be more than enough of a performance gain to justify the added cost of the Eggs. This is where it really gets interesting. 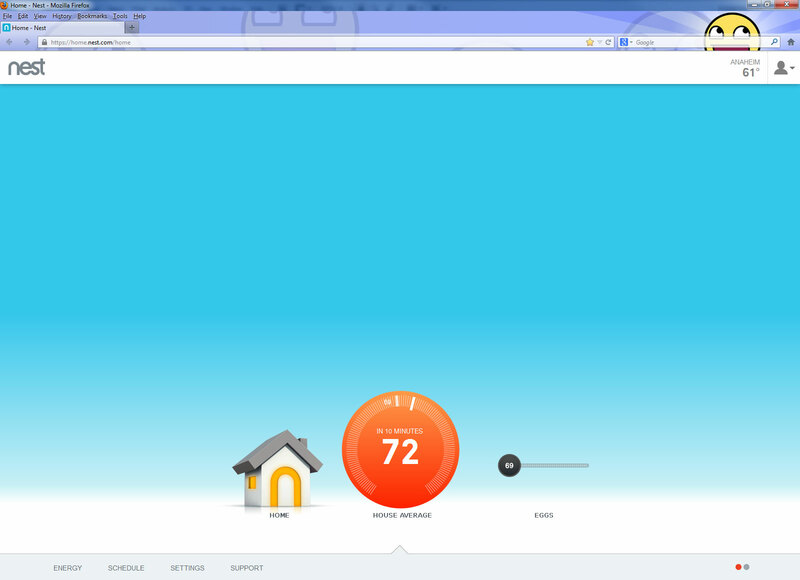 Here you can view the current temperature of every Egg in your home. You can even direct the Nest to turn on your HVAC system until any single Egg reaches your desired temperature, irrespective of Nest’s programming or of your home’s current average temperature. In homes like mine with two stories and only one thermostat, this is key. Temperatures between floors and between rooms can vary wildly, and this fine level of control would make the Nest even more valuable. Maybe you want it to be 70 degrees in your bedroom when you wake up every morning. With current Nest hardware (or with any thermostat) there’s no way to guarantee that that will happen. You can only guarantee temperatures that the Nest can sense, and right now I’d guess it’s blind in 75% to 95% of most homes, making only educated guesses using the two temperature data points to which it has access: that of the zip code outdoors, and that of the Nest’s single location indoors. After a brief initial learning period, the Nest would know which temperature trends to expect across Eggs. The Master Bedroom might run about 5 degrees warmer than the Office in the mornings and 7 degrees cooler in the afternoon. Each Egg’s slider would move relative to the others. What I’m ultimately after here is a way to give Nest users the freedom to change either a home’s average indoor temperature, or a way to adjust the temperature to serve the needs of any one specific room. That’s why Eggs would be an entirely optional add-on accessory. Don’t want to shell out the extra cash for one? No problem. With or without Eggs, the Nest that you’ve got on your wall today will continue to operate as it always has (smartly, but still mostly blind) for years and years to come. However, if you’ve got a large home or even just an average-sized home with inconsistent indoor temperatures, Eggs would radically change the way you use your Nest (for the better!) and could fundamentally change way people think about what thermostats are, how they work, and how we interact with them. The original Nest already did something like this – to great effect! But there’s no need to stop there. Maybe some day I’ll tell you all the great ideas I’ve got for what a Nest alarm system would look like. The entire home alarm industry is what I would characterize as “consumer-hostile” and is ripe for a disruptive revamp. I could go on and on about the state of the home alarm system industry, but the Internet’s already got enough angry people so I’ll can it for now. UPDATE: I lied. I couldn’t shut up about alarm systems, either. Great idea! I hope the guys at Nest are listening. Brett – excellent job of pulling together everything I have thought about for make the Nest better and more and putting it out clearly with the reasoning behind your ideas. I currently living in a 3 story house and have an old thermostat that just happens to be behind a china cabinet. I would love to be able to place a senser elsewhere that communicates with the main unit via wifi. Hopefully Nest will work towards making this happen, seems they already have the hardware and comm links – just need to separate the sensor and display from the main unit then develope the software. Looking at follow up comments, I would also add the functionality of motion sensing. Then the Nest can automatically choose to regulate to the temperature of the occupied room rather than the average of the house and also be more accurate in the auto away function. I would be pretty shocked if Nest hasn’t reached out to offer you a job. *I* would, if I worked in that industry. You have written out my thoughts exactly. Nest is trying hard to be great, but they can be even greater. This egg you’ve describes is an elegant solution to a complicated problem. Bravo! Love this idea. I agree with adding the motion sensors to the Nest Egg. Very clever name, too. 🙂 I’m sure Nest will make many of these ideas happen in the years to come. I’ve been thinking the same thing… one slight difference. I would suggest that the egg you spec (the wall plug) is both a detector (temp, humidity, motion) and also a bridge between a low power wireless protocol and wifi. Then low-power sensors could be placed in more optimal locations (walls, ceilings, etc) and would communicate w/ the egg. When version 3 comes out, they could incorporate the bridge into the nest, so only the little transmitters are needed. the electric outlets in my home arn’t ideal for detection of temp, and more importantly, motion. the low-power sensors could be battery powered and placed anywhere. This is an excellent idea. Temperature sensing is definitely a smart addition. Nest Egg fits nice for naming. I would agree the unit should be battery powered. Most outlets are low to the floor and could be limited in correctly sensing temp. I would suggest they come with a rechargeable battery for a green offering. In addition, the programming should incorporate a fan control function which would track temperature changes over time and use the fan to average space temps. This would help mitigate overshooting a particular space temp. With an averaging function, the more Eggs, and the more Nests connected to Eggs by zones, the better and smarter overall home performance in comfort and energy usage. This is a must! Honestly, this is the future of the nest. I have a one bedroom loft with 9 107″ x 37″ windows facing the sun. I can get the hallway cool to 72 but the rest of the place is like 75. This needs to happen! I’ll buy three eggs or whatever they are called! Brilliantly simple design that will solve another problem: Poorly designed control location in older homes. Since most of us retrofitted our homes with the nest, a thermostat location, by an entry door for instance, may be a very poor indicator of the temperature in the area the HVAC unit serves. Your design, as amended in the comments, would be a simple, elegant solution. Most higher end programmable thermostats on the market now have battery powered remote thermostats available as an option. Nest should, too. From a product marketing POV, many existing NEST owners will likely buy one or more lower cost, optional “Eggs”, but not additional NESTs at $250 each. This idea is what I was thinking as well, and have wrote Nest support about it as well. I must say your Egg pitch here is fantastic and I think it would be insane if they did not jump on this. Motion sensor would be nice as well to have for monitoring reasons. -D.Duchman I have to disagree with your statement as buying a Nest only serves if you are replacing a thermostat so these eggs would have no bearing on that. Great idea! I would love to see this come to fruition. Only mod change I’d suggest is allow the Nest Eggs to allow the plug to still be used as opposed to using it up entirely. In other words, the plug is still useable by another device (light, clock, vacuum etc…) while the egg is plugged in. at Baitbigfish. It is easy to catch these species using a light road-and-reel combination. It will be diamond robbery, which is to take place London. Great idea. I’d love 1 egg for my lower floor. My Nest is on the upper floor with lots of natural light and many picture windows facing south. I’d love the option to just simply turn the blower for my furnace on when the temp difference between floors is more than 5 degrees different. This would take the heat from the upper floor and the cool from the lower floor and mix them. When the temp is back to 1-2 degree difference turn the blower back off. One could also use this information to ‘calibrate’ the registers in each room so that the airflow worked in such a way as to normalize the temperatures.. so if the master bedroom gets cold quickly vs. the living room, we would be able to maybe throttle the air into the bedroom so that both rooms would heat or cool more evenly vs. time..
For me, having secondary motion sensors is more important than temperature sensors. The wiring for my thermostat is in the worst possible place for the nest where you only trigger the sensor when going down into basement. So it is constantly going into away mode when people are home. David, good idea, but no can do. According to Nest’s own documentation, the battery-powered Protects only phone home once every 24 hours (unless there’s an alarm). Anything more than that would kill the batteries. it would be event better if the Eggs controlled the Thermostatic valves on the radiators in the room so that Nest could ensure an even spread of warmth through the home. Additionally you could have different temperatures for specific rooms (like bedrooms). This is a great idea. Add a sensor for occupancy would make it even more functional. Also the Nest itself could run the fan only to try an balance the air in the home when heat isn’t needed on a single zoned HVAC system. And the same for cooling. A little more smarts and it could run the fan only or turn on cooling or heating based on how the temperature through out the home reacts. Don’t forget, at time some rooms are warmer because of natural sunlight and running the fan by itself could harness that heat form one part of the house and mix it with the rest of the home. More energy savings! Funny, I was looking at ecobee which has this feature already, but decided to try Nest first. Liked it so much that I ran out and got a Nest Protect alarm a couple days later. Then, I realized those probably already have temp sensors for future functionality like house average or room targeting. Indeed, sounds like temp and humidity included! https://nest.com/support/article/Learn-more-about-the-Nest-Protect-sensors#! Even more excited about split ductless heating and cooling to improve and supplement archaic forced air and expensive fuel. Just a small percentage of HVAC pros know about those in the US so far, including one in my BNI group thankfully! If this had a motion sensor for Auto-away, I would buy it in ah heartbeat. I almost bought a Nest for my dad, but it wouldn’t work without a Nest egg, if this was offered, my family would immediately purchase 4 more Nest and about a dozen Eggs. Amazing idea. I hope they’re listening! Duh. It is already on the market, made by Nest. It’s called Nest Protect. Don’t u guys know they have zigbee implemented already? In Europe they run a hub on it. I have one. I just bought a nest about 3weeks ago and the first thing I was looking for was sensors for each room that could communicate to the nest… I was surprised to find that there wasn’t one and then I found this article! Nest, please listen to this article. It’s excatly what I thought you would already have had!! OP, nice write up and mockups. This is exactly what everyone needs. I wonder what Nest is waiting for. This is a great idea however I don’t think it’s going to happen since the first post was two and a half years ago. http://getnotion.com/ has small wifi sensors. Ecobee has sensors but nest has an overall better user interface and much bigger distribution. You can use sensors such as the temperature sensors that are compatible with Wink but it takes some engineering to get everything to work. I did find one upgrade for my nest that worked well which was the cover plate from amazon http://www.amazon.com/Round-Wall-Plate-Nest-Greenfii/dp/B00T3TEPT6. I liked this better than the plastic plate that came with the nest and it saved me from needing to paint. SHUT UP AND TAKE MY MONEY!!!!!!!!!!! i like the NEST – have a couple of them, but getting the temperature correct in my babies room out weighs everything. Have you tried to develope this at all? I’ve been thinking about a similar product and ran across your site. Dude – years on from the original article and people are still posting. It’s a tremendous idea. Like the guy above me, I love my nest but have just moved it into the babies nursery from my lounge. It’s too damn cold in there otherwise! ‘Eggs’ are a great idea. I’d step up to to smart radiator valves to go with the egg (optional) so you can individually control one room ie the babies room. WHERE ARE YOU GOOGLE, LISTEN TO THIS! Be even nicer if the power outlet could be replicated on the front, so you don’t loose an outlet. The power requirements for the device would be minimal, so replicating the outlet shouldn’t be a problem. We are building something similar to this, our Puck. Hi, Yes… Nest IS this decades TIVO and they are getting beat by their own entry into the space without these remote temp sensors (a must to stay competitive). An issue I see with your wall plug design is that outlets are to low to the ground to get an accurate reading so this type of power may not be wise all the time. Adding a usb option to plug into things like TVs (depending on their heat output) or a modified laser sensor to get a temp higher than on outlet level.on the wall is needed. I am switching from Nest to Ecobee4 now. Nice that Flair will work with Ecobee, too.